Replies: 22 (Who? ), Viewed: 55821 times. #1 9th Apr 2007 at 6:55 AM Last edited by tiggerypum : 18th Dec 2007 at 5:02 AM. 6) If your creation has more than one Group/Subset, the polycount is ALL of them added together. What is a reasonable poly count? Most body meshes are in the 2000-3500 range on poly count. Extra details or alpha additions tend to make the count a bit higher. Hair is also usually in about that same range. For objects - the rule of thumb is to aim for 800 poly or less per tile that the object takes up. But again - that can vary depending on the detail of the object. Comparing to several similar Maxis meshes is another way to see if your counts seem in line with 'normal'. Generally if you're not within the range of similar meshes made by Maxis - then you should investigate ways to reduce the count. If your poly count is twice Maxis amounts - that is high, but perhaps justifiable, if the item has a lot of curves or extra details. Higher than that it should be something super-special. You're taking the time to make a mesh; take time to know what is a 'normal' poly count and to use just enough mesh detail to get the effect you want and create more detail using your textures. The better your textures, the better the overall impression your mesh will make. Each item and sim on the lot you're on has to be loaded into memory - the textures and the meshes - to be rendered by the 3D graphics card *in real time* so that you can move about on the lot and see everything. While one item being high poly will probably not impact things, the more high items on the lot, the more likely things will slow down. Most folks don't like their game to get all laggy and slow. That is why certain details are created by using good textures, and the meshes are created on the simpler side and thus lower poly. Of course we don't want everything to just look like a box, so there will be polys in your creations. But make an effort to keep them reasonable, and everyone's game will be a happier place. 11/7 -09 My beautiful niece was born! around 5000 should at least have a warning attached about the polycount, but that's just my opinion. hey is this some kind of program to make sims? j8799, SimPE is a program that allows us to edit game files, like make new meshes and do other things that Maxis/EA didn't give us tools for. Oh my golly gosh, I just did this with a necklace (yes a necklace) that seemed to make my game lag, and the poly count is a whopping 11760. 11k polys for a necklace? No wonder my Pc was screaming for mercy! It's definitely getting binned! #8 26th Dec 2007 at 12:10 PM Last edited by t2suggas : 29th Apr 2008 at 3:02 PM. You can also find your polycount in Milkshape (For those who forgot to check, this can be quicker than loading SimPE). Open Milkshape, Import or open your finished GMDC. 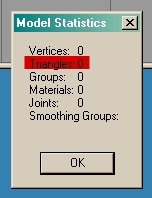 Go to 'Tools', 'Show Model Statistics.....'. The box that pops up shows all polycounts,etc. What is an acceptable poly count for vehicles? I checked in SimPE and most of the ones I've downloaded range over 20,000. Is that normal? AyameS - vehicles are... an oddity. They have detail inside and out, and many of them are very high - although the game vehicles are also higher than the usual guidelines for objects. Then again, you're likely to have 1 car on the lot. I suggest you browse some of Dr Pixel's cars to see what he's been able to do with them. Many of his cars seem to come in more like the 10,000 range. In one I noticed that he mentions that the game vehicle was around 6500. I downloaded some of his cars and they certainly have less polys. Thanks. Thank you so much!! You are most helpful to us stuggling starters. where can i download simsPE or Milkshape? beth.addict - It's not that hard to type either one into Google... Please keep your posts on topic. Re. the number of tiles the object uses--should we count only the tiles physically occupied by the mesh, or also those 'reserved' around it where nothing else can be placed? Since there can be several GDCs in the container, I would like to know how do you treat the final count when it comes to hair? For a single object, several GDCs are all combined and the final number is the objects polycount. But when it comes to hair, usually one GDC is one age (child female or male GDC, teen female or male GDC...). Is it safe to use a hair mesh of e.g. 12000 polys, if you are following a guideline of 3000 polys tops for hair (but also per age in this case)? Someone has made hair with over 20,000 polys!! Hey, this tent has a poly count of 3394, is this too much for something like this and do you know where I can get a better tent if this is too much? when i changes someone's hair look (especially the female sims) it takes forever to get this to work. @sailorleontine6, if you haven't previously in that play session opened CAS or any CAS related menu (buy clothes, change appearance, etc. ), it's normal for the game to spend some time loading in the CAS items. The more CAS custom content you have, the more time this loading will take. 0-2 minutes doesn't sound too bad. Depending on the hair (and whether you already have problems with slow loading), it can take a little while from when you click on a hair to the change showing (a few seconds). However, if this is taking 1-2 minutes, that's usually not normal if it happens all the time. May be a problem with high-poly hairs and if they've got a lot of textures, though. If you've previously deleted cache files and the CAS thumbnails, the loading of CAS items will usually be much slower than usual, and this may also apply to clicking individual items.